The weather has generally continued fine and dry over the past three weeks at the High Pasture Cave site and we have been blessed with an excellent core of volunteers, to which we extend our sincere gratitude for their hard work and professional approach to the project. Excavations have continued in Trenches 2, 15, 19, 20 and in the various test trenches, and the following update provides details of some of the more significant results. Excavations around the stairwell continue to unravel a complex and intriguing narrative for the development of the site in this area. In the last news update, I provided details relating to the uncovering of at least three phases of modification to the head of the stairwell including paving, revetment walls and hearths. The continuing work here has revealed a major modification relating to the access to the head of the stairwell. Access prior to the closure of the site was from the east via a series of three small steps, which ascended to the head of the stairwell. The two phases below this horizon also approached the stairwell from this direction. 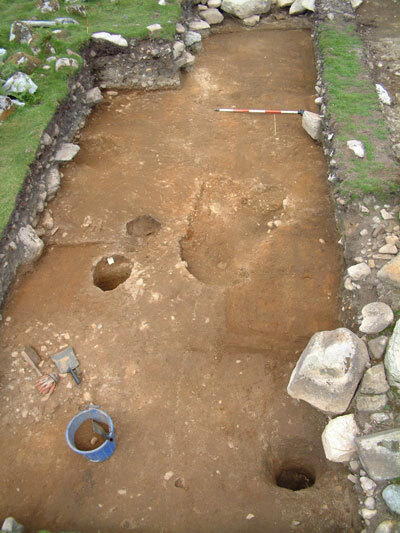 However, the discovery of a large upright slab, as shown in the image above, with a sequence of two superimposed hearths to the east, effectively blocked off access to the stairwell from this direction at this level. 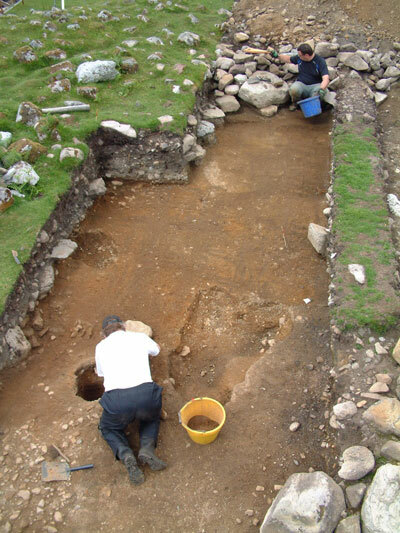 With the removal of the hearths and archaeological deposits around the stairwell entrance, the full extent of the large upright slab was revealed. The image above shows the alignment of the slab from above (from the north) with access from the east (left in this image) blocked. 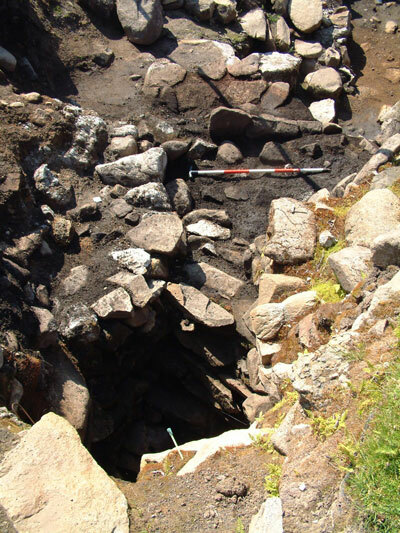 The proximity of the slab to the hearths had caused severe burning and fracturing of the granite rock, and it is possible that the height of the slab was designed to shield the heat from the fires for anyone accessing the adjacent stairwell entrance. The image above shows the upright slab from the southeast with the entrance to the stairwell to the right. Beyond the slab and within the standing section of the trench, two vertical alignments of stone can be seen. From our excavations to date it appears that these two walls show the location of a backfilled walkway that descended to the head of the stairwell from the west. Excavations in this area of the site in 2005 and 2006 revealed a fairly steep slope descending to the stairwell, with dark charcoal-rich lenses of material that included Iron Age pottery, animal bone and burnt plant remains. Excavations below the level of the stairwell have now reached complex ash deposits relating to earlier activities around the hearths located in the deep natural hollow outside the cave entrance (pre-dating the construction of the stairwell). Finds from the excavations in this area of the site continue to produce butchered animal bone, burnt plant remains and a growing number of small finds; the latter including stone tools, a soapstone spindle whorl and a fine bone hair or dress pin. Digital images of these finds will be posted on the Latest Finds page soon. Excavations in Trench 15, the area including the deep natural hollow outside the stairwell and cave entrance to Bone Passage, have uncovered a continuation of the monumental wall that enclosed this area of the site. The main face of the wall addresses the inside of the enclosure, which includes the stairwell and hearth features. The back of the wall is less obvious here and has suffered some subsidence. After revealing the full extent of the wall, we cut a section through it to reveal the method of construction. The image above shows the section through the wall, with the main face to the left and the back of the wall to the right. The core of the wall comprises a fill of boulders and sediment, the latter including charcoal flecks. We also recovered some animal bone and teeth, and a significant amount of shellfish remains including periwinkles, some mussel and oyster shells. Most of these shells were found within air-filled voids within the structure of the wall and must have been placed there during construction of this feature. Otherwise, we have found few small finds/artefacts from this area so far, with the exception of a few degraded fragments of pottery and a small fragment of quern stone. The wall has been built on a chaotic pile of rubble, which shows signs of subsidence into a possible feature below. 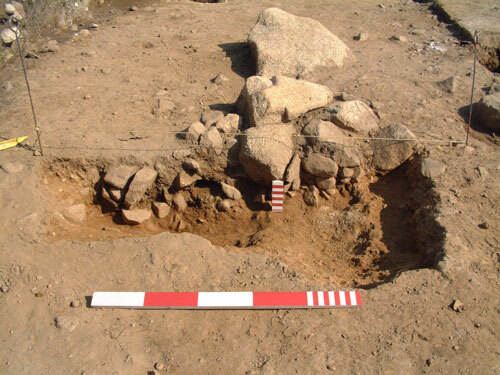 Excavation of the rubble layer continued to produce shellfish remains and some animal bone and teeth, while small finds have included fragments from a burnt saddle quern stone and two quern rubbing stones. Two halves of a fine bronze disc have also been recovered from this area. The disc has been manufactured from thin, beaten bronze and is slightly domed. A line of possible decoration can be seen running around the outer rim of the artefact, while small rivet or pin holes around the circumference suggest that it may have been attached to a wooden object. A significant amount of stone has already been removed from this area, some of the granite boulders of large proportions requiring some devious tactics to get them out of the trench - including the use of sledge hammer and chisel, or dragging them up a wet wooden plank. 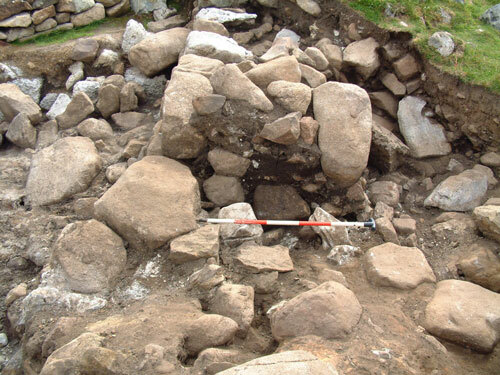 The use of boulders to landscape the site at High Pastures has been noted in previous news reports and presents a challenge in both the physical aspects of this work and our subsequent interpretations of why it was carried out in prehistory at this site! Excavations have continued in Trench 20, where we have now reached the bedrock and uncovered a small post-hole or pit feature, and within the test pits and trenches located to investigate geophysical anomalies and to evaluate the extent of the burnt spreads of stone. 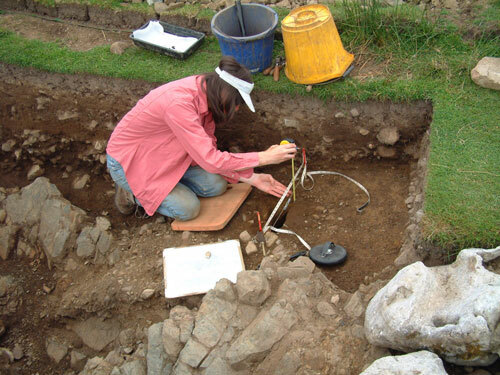 The image above shows Catriona Graham recording the section of the feature in Trench 20, from which she recovered some nice charcoal lumps for radiocarbon dating purposes. However, the trench did not produce many small finds, with the exception of two fragments of iron slag and one piece of pottery. 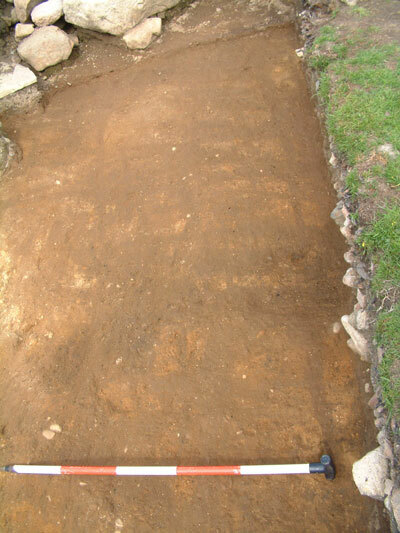 The test pits excavated to the south of Trench 20 have revealed a linear wall feature and associated burnt mound deposits, all of which require additional excavations to reveal the potential function and content. Some of the test pits have now been joined together to provide a wider area of excavation, while finds include pottery sherds, some iron slag and burnt hazelnut shell. 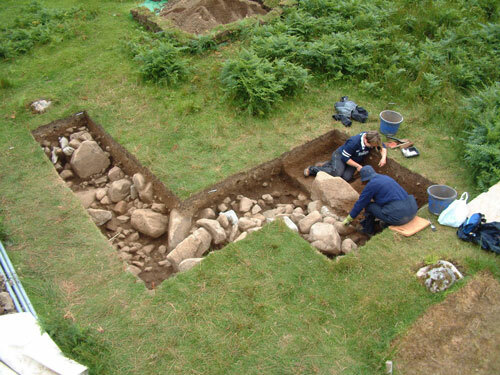 The image below shows Maxine Paterson and Sue Watkins excavating in this area of the site. Excavations within Trench 19 have now removed the extensive burnt spreads of fire-cracked stone to reveal a suite of features pre-dating their deposition in this part of the site, northeast of the stairwell/cave entrance to Bone Passage. 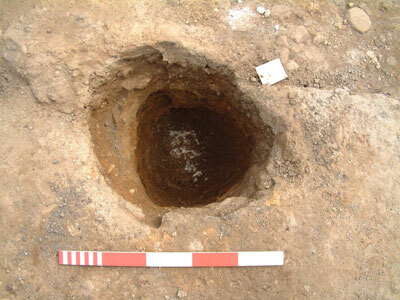 The image above shows one of three post-holes excavated in Trench 19, all of which included packing stones in their fill. 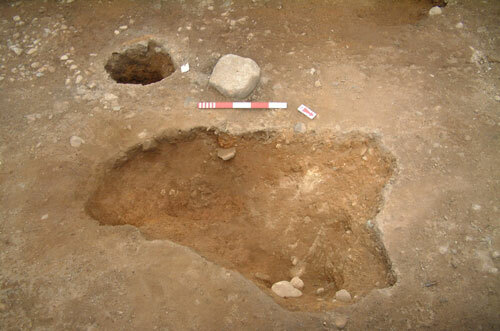 Other features excavated in this area include areas of cobbled surfaces, stone-filled scoops and a more substantial pit containing larger stone clasts (see image below). No finds were recovered from the pit, but the sediment between the stone in the feature contained charcoal flecks and piece of burnt hazelnut shell. Therefore, we should be able to secure a radiocarbon date from the shell to enable us to see if the pit is contemporary with the other features, or not. 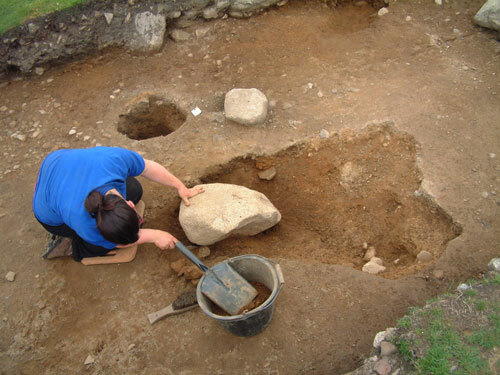 The image below shows Anna MacQuarrie excavating around one of the larger stones in the pit feature. One of the post-holes cane also be seen in this image, while the small granite stone was found to be covering another small pit feature containing a charcoal-rich fill and one degraded piece of pottery. One of the post-holes and a shallow stone-filled scoop also produced individual sherds of pottery. The image above shows the large pit feature after removal of the fill deposits, with the post-hole beyond. The post-holes and features uncovered so far within this area of the site do not make any coherent structure, such as a post-built house. Therefore, we will extend our trenches in this area in order to evaluate further their function. The post-holes in particular appeared in the trench as we removed the last of the burnt spread deposits, the latter dating to around 2550 before present (before 1950); while charcoal from the fill of one of the post-holes has been dated to 2490 BP - placing their use during the Late Bronze Age/Iron Age transition. At the base of the burnt spreads of fire-cracked stone and ash deposits we oncovered a firm layer of sediment with charcoal flecks, below which we excavated through a deposit of iron pan (a mineral-rich horizon below which drainage of water has been inhibited). Immediately below the iron pan we uncovered a buried soil horizon containing more charcoal flecks and lumps and degraded fragments of pottery of possible Bronze Age date (All Over Cord Beaker). As we carefully removed the brown soil deposit from this horizon we started to uncover the orange-coloured natural karstic clay, which is a fairly iniform deposit across the site where we have reached this level. However, has we started to expose this horizon, a series of dark lines were uncovered (see image above, showing Mike Corcoran and George Kozikowski working in this area). These marks were found criss-crossing the exposed area and we soon realised that what we were seeing here was evidence for prehistoric plough marks, or ard marks. 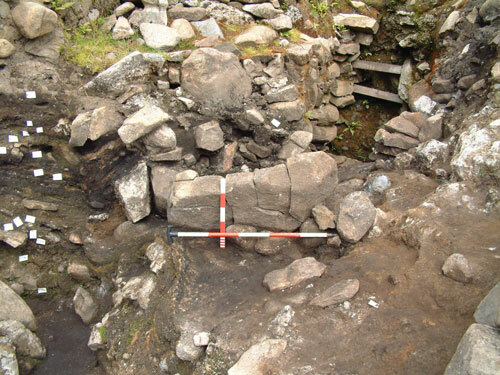 This is the first set of ard marks to be uncovered in Skye, while elsewhere they have been found in the Western Isles and other areas of the Scottish Mainland. 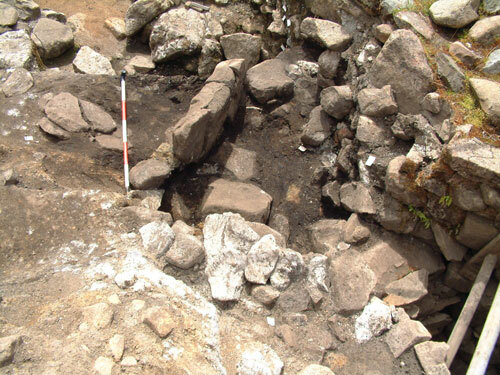 The well-preserved examples uncovered at the High Pasture Cave site have been protected by the overlying burnt spreads of stone, while the area around the site has not seen any later ploughing activity. The image below shows additional ard marks revealed during the removal of the overlying plough soil. It is obvious from our excavations in this area that the pit, scoop amd post-hole features all post-date the ploughing activity; these features having been cut through the ard marks. These are fairly rare features to find on an archaeological site of this type and age, while we did not expect to find any evidence for ploughing within such a ‘marginal’ piece of ground, which contains a significant number of natural rock outcrops. Pollen analysis undertaken at the site has indicated the production of crops close to the site, but we had originally thought that this took place in the bottom of the valley where more fertile soils can be found. 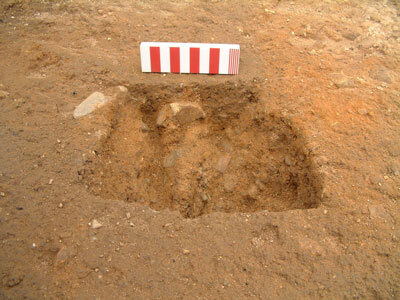 The individual ard marks are filled with the same plough soil that overlies them. However, we have started to excavate sections through the individual marks to reveal the profile and cross-section, and to take samples of the sediment filling them. The ard marks excavated so far have revealed a v-shaped profile indicating that they may have been formed by a fairly pointed wooden ard tip (see image below showing two individual ard marks running parallel to each other), while the sediment filling them contain some charcoal lumps of adequate size for radiocarbon dating purposes. Hopefully, analysis of the samples may also reveal pollen grains and other environmental information relating to this earlier use of the site in the Bronze Age. Having a bit of a job to get my eye in on these “ard marks”. An overlay, or something similar, would help a lot. I’m still trying to find a “object for scale” like your “measuring stick”. But for stereo photo-microscopy. Any ideas? The best I’ve had so far is “blood-cell” counting slides, which are appropriate for the small-fraction-of-a-mm scale range, but the 1/2mm to cm range still defeats me. Hullo, Ive really enjoyed your web site, and have visited your dig, or” Kennys empty whisky bottle hole”,when I was staying with family on Skye.Im pleased to hear you have funding for another year,and I hope you get more,its fascinating work you are doing.Good luck with your dig, and future funding, regards, Stuart.